Like TF2 fans, Kerbal Space Program players can tell the importance of any given update by watching the animated short that accompanies it. Squad’s new trailer is a full 1:57 seconds long – because it heralds a huge expansion of the game’s career mode. 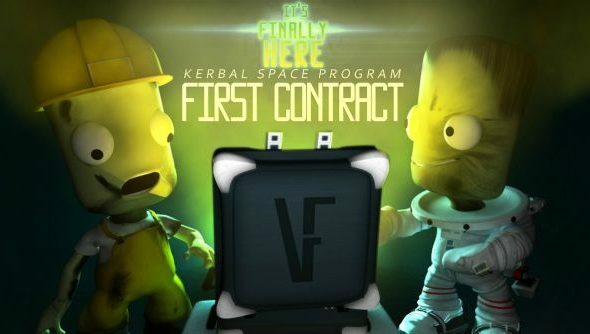 Kerbal Space Program: First Contract is out now. Here’s its trailer: in which a Kerbal lands safely back home on Kerbin, decides that simply won’t do, and heads to the nearest Junkyard to source a way to get him killed. Expect charming Despicable Me-isms. Players can now take out contracts at the Mission Control facility to earn three resources – Funds, Science and Reputation. They’ll need funds to launch vessels, and a good reputation to gain access to the most exciting (and dangerous) contracts. Players scraping together funds for ambitious missions can now return to planets they’ve previously landed on to salvage parts of crashed or abandoned vessels. Squad have also “vastly overhauled” the game’s many UIs, while ensuring it remains “mod-friendly”. The developers have put together a comprehensive changelog for the update. When was the last time you stepped off the Kerbin and into big old space?